A couple of year ago in Paris, while walking to Jardin du Luxemburg, we stopped by Gerard Mulot to ogle at his beautiful desserts and pastries. Amongst the cakes we picked up, there was this particular pistachio and raspberry one that stayed etched on memory; it was art made with a pistachio macaron, a pistachio dacquoise and fresh raspberries. It was beautiful. It was a particularly cold and grey autumn morning. The trees were on the verge of becoming bare with a few orange-brown leaves here and there. We sat on a cold black bench facing the pond. I remember the messy affair of eating the cake from the box . The flavours were unforgettable. 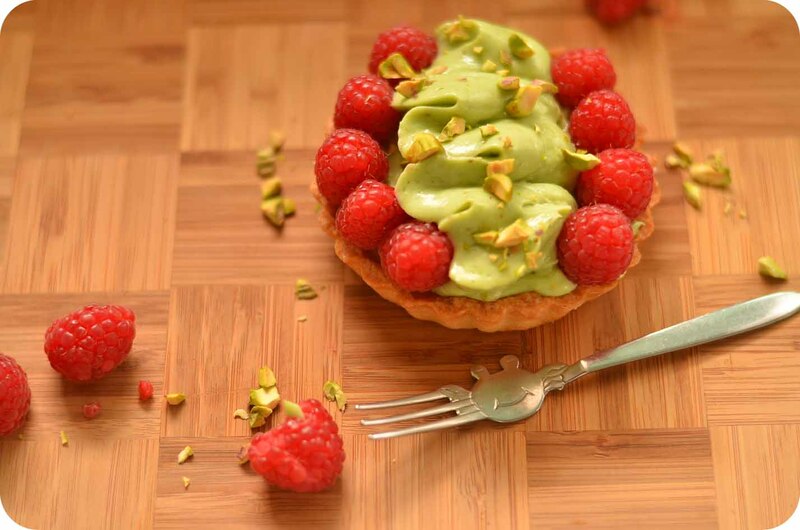 The pistachio and raspberry meld together like they are meant to be. On a recent day, I started thinking about that particular cake. Even though I can remember how I particularly like that cake, I can only vaguely remember it’s components (I’m sure that wasn’t all) – a pistachio dacquoise, pistachio macaron and fresh raspberries. In any case, I just decided to make my own interpretation of a dessert with raspberries and pistachio. 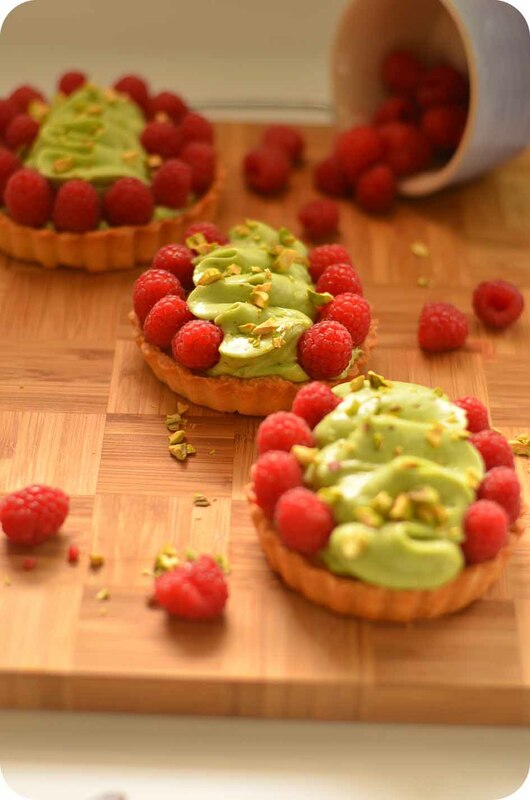 I really like how this one turn out – a crumbly tart base, a pistachio chewy cake centre, a rich and smooth pistachio crème mousseline with fresh raspberries. It works like magic but I think I would be giving magic too much credit. There is just something about the different textures of pistachio that goes with that burst of bright acidity from the raspberries. I can feel Paris drawing closer with each bite of this tart. Oh yes, I’ll be revisiting this beautiful city once again this autumn. This time with my best friend. Did I mention how much I love this city? I’m more than psyched! I recently finished reading “A moveable feast” by Ernest Hemingway (beautiful book) and it made me picture all the rues of Paris, le métro, les jardins like I always have been living there all this while. Paris was is worth it. I love the combination of raspberry and pistachio – it works so beautiful and their colours of red and green is just as eye-popping. You will have leftover pastry dough from this recipe which you can freeze and use over the next month. + I shelled pistachio nuts before grinding them down in my food processor to the consistency of almond meal. 1. Prepare the Pâte sucrée: Place flour and caster sugar into a big bowl. Whisk to distribute evenly. Add in cubed butter and rub butter with the flour and sugar mix till fine breadcrumb consistency. 2. Add in egg, vanilla and zest till mixture is just combined. Alternatively, you could opt to use a food processor for the first two steps. Be very careful not to overwork the dough. 3. Roll out the dough into a flat disc, cling wrap it and let it rest in the fridge for at least 20 minutes or overnight. 4. Dust flour sparingly on the dough and work surface. Roll dough to approximately 3mm thick. Transfer the dough into the tart tins. 5. Place a sheet of crumbled parchment paper over the top of the tart shell and weigh it down with baking weights or uncooked rice/beans. This will prevent the sides of the tart from sliding. Another tip is to bring the tart dough slightly over the edge before baking. 6. Blind bake the tart shell in a 180 degree celcius pre-heated oven for about 15 minutes before removing the baking beans and baking the tart shells for another 5 to 10 minutes, or until golden brown. 7. Prepare the pistachio frangipane: Using the paddle attachment, beat the cubed butter and caster sugar until pale and light. Add in the eggs and continue to beat until incorporated. 8. Add in ground almonds, ground pistachio, and flour and mix until well-combined. 9. 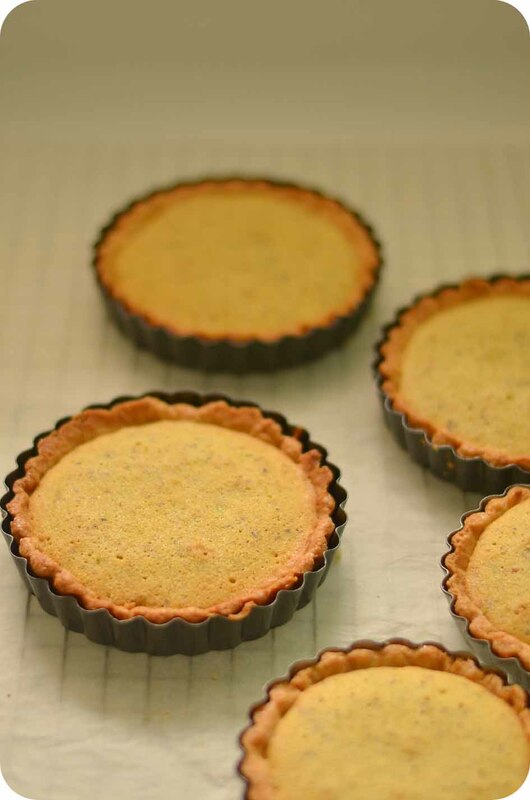 Fill the tart shells with the pistachio frangipane (about 2/3 full as the frangipane will expand when baked) and bake in a 180 degrees celcius pre-heated oven for about 15- 20 minutes until frangipane is golden brown, and springs back to touch. 10. Prepare the crème mousseline: To make a crème mousseline, start by making a pastry cream. Measure out all your ingredients before you begin. In a pot,place milk into a medium size pot (big enough for all the ingredients). 11. In the meantime, whisk egg yolks with sugar in a separate bowl until well-combined before adding the cornflour. Whisk till mixture is well-combined. 12. Place the pot of milk under medium heat. When the milk starts to boil, take the milk off the heat and pour it into your egg mixture. At this point, whisk quickly to incorporate the milk mixture (before it cooks the egg mixture). 13. Pour the milk and egg mixture back into pot (under low heat) and whisk continuously (as if your life depends on it!) This step is crucial to prevent lumps from forming in the crème patisserie. 14. Ensure that you whisk the egg and milk mixture until you achieve a smooth, thickened paste. Allow the pastry cream to cook for at least 2-3 minutes before taking it off the heat. You should see one or two large bubbles forming. That is an indication that the pastry cream is done. Whisk in the pistachio paste and vanilla extract. 15. Using a scrapper, transfer the pastry cream onto a tray lined with cling wrap. Cling wrap the pastry cream. Cool it down in the fridge before using it. 16. When the pastry cream is cooled, whisk it using a paddle attachment. Add in the room temperature butter, a few cubes at a time and beat till light and fluffy. Add in a drop or two of green food colouring if you would like your pistachio creme mousseline to be more green. 17. To assemble the tarts: Spread a thin layer of creme mousseline onto the tarts. Then, using a saint honore piping tip to pipe a squiggle in the middle of the cooled tart. 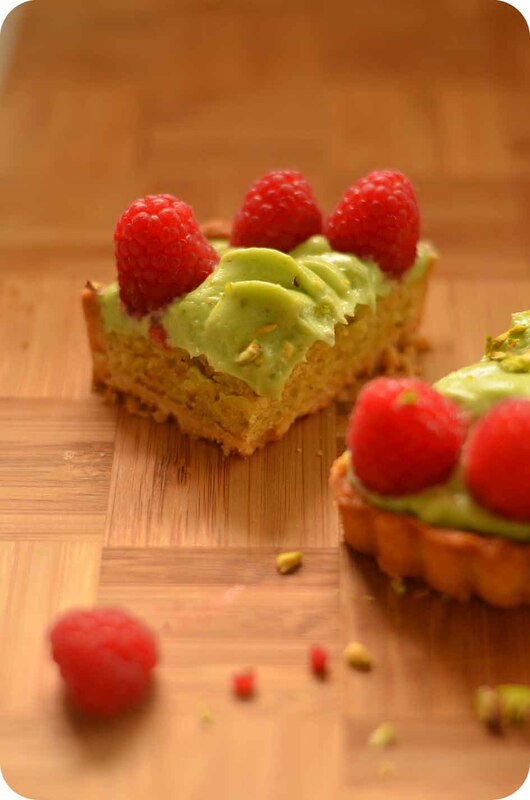 Line the sides with fresh raspberries and finish the tart with a sprinkling of chopped pistachio nuts. *Tarts are best eaten on the day it is made. Keep refrigerated after it is assembled. This entry was posted in Baking, Tarts & Pies and tagged creme mousseline, Frangipane, pastry, Pâte sucrée, pistachio, raspberry, Tarts. Bookmark the permalink. Looks beautiful! I went to Paris 2 years ago. It is truly an enchanted and tasty city. I can’t wait to go back! Thanks! Yes it is a truly enchanting city with so much good food and desserts! Your pictures, narrative and recipe have transported me back to Paris …. without the jetlag! Thanks! I’m glad that I did that. Pistachios go wonderfully with raspberries! Sigh! Those lovely food memories 🙂 And what a gorgeous recreation of that pastry Jo! The Parisian influence comes through loud and clear here! The pistachio and raspberry combination is so classic, yet still current because something so delicious could never get old. These are sweet little winners, no doubt about it. Oh I can’t wait until you go to Paris, so I can “go” too!! 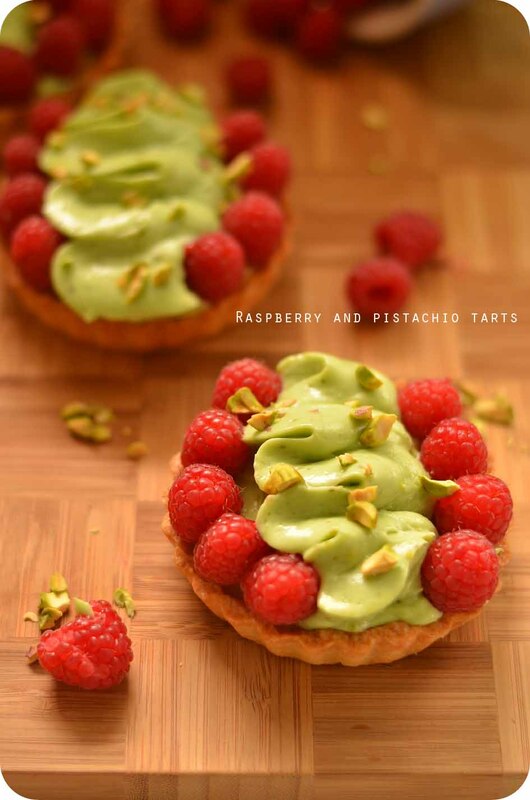 The combination of raspberries and pistachio, two of my favorite flavors, must be wonderful. Is cornflour the same as cornstarch? Looks amazing, by the way! Thanks for sharing the recipe! I tried it recently and wow everyone said it was soooo soooo good!! Pistachio really goes well with everything and that crust is omg so yummy!!! 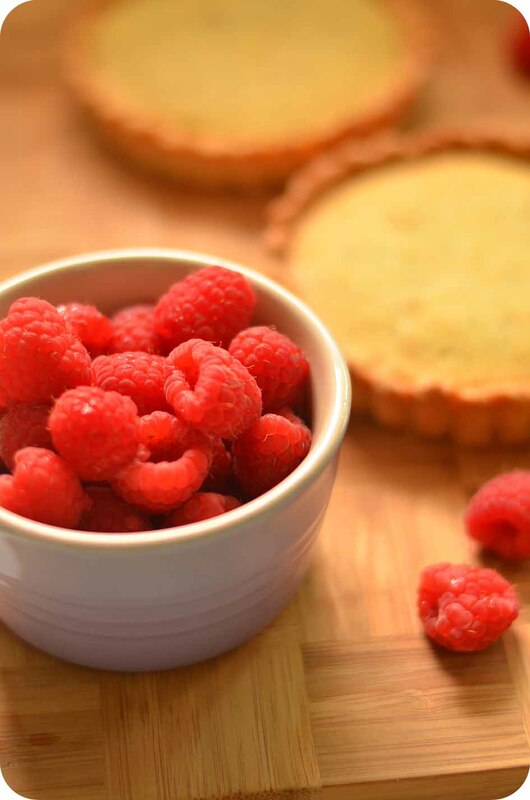 Gorgeous tart and just the recipe I was looking for! One question about the pistachio paste you use for the pistachio creme mousseline – is it the canned paste that I have seen sold in gourmet supermarkets? If so, does the canned paste usually contain sugar? My problem is that I am having a hard time finding canned pistachio paste. So I was going to try and make my own pistachio paste. BUT, I have seen two basic recipes for pistachio paste, one with sugar added (like a praline) and one without (like a nut butter). The recipe with sugar is similar to a praline recipe, i.e., toasted pistachios are combined with a sugar syrup and cooked until the pistachio/sugar mixture crystallizes, and then ground up (often called praline). The one without sugar is just pistachios ground up with sunflower oil but no sugar is added. SO, if I make my own paste, which recipe should I use? Thanks so much!! !